The objective of the steer wrestler, who is also known as a "bulldogger," is to use strength and technique to wrestle a steer to the ground as quickly as possible. As with tie-down and team ropers, the bulldogger starts on horseback in a box. A breakaway rope barrier is attached to the steer and stretched across the open end of the box. The steer gets a head start that is determined by the size of the arena. When the steer reaches the advantage point, the barrier is released and the bulldogger takes off in pursuit. If the bulldogger breaks the barrier before the steer reaches his head start, a 10-second penalty is assessed. When the cowboy reaches the steer, he slides down and off the right side of his galloping horse, hooks his right arm around the steer's right horn, grasps the left horn with his left hand and, using strength and leverage, slows the animal and wrestles it to the ground. His work isn't complete until the steer is on its side with all four feet pointing the same direction. 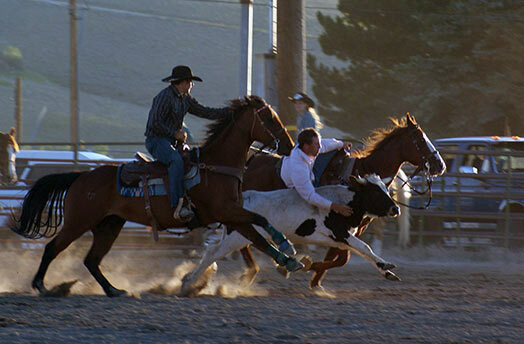 The cowboy uses a "hazer," who is another mounted cowboy who gallops his horse along the right side of the steer and keeps it from veering away from the bulldogger.